The HIMOINSA Team riders are granted with a time bonus in return for stopping to assist injured riders during stage 8 between Uyuni and Tupiza. Tupiza (Bolivia). 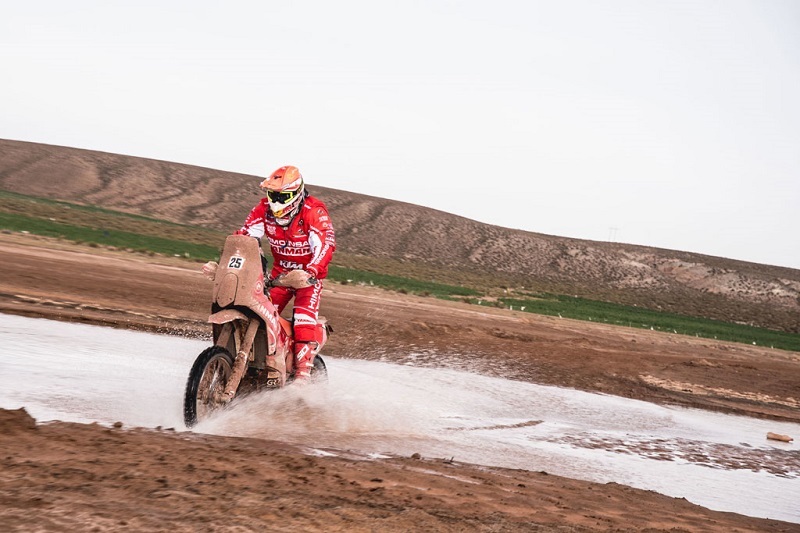 During the second part of yesterday’s very hard marathon stage, many pilots suffered with problems, either from accidents or due to the physical exhaustion to which the toughness of this Dakar has subjected them. When Gerard Farrés found Pablo Quintanilla with visible symptoms of an anxiety crisis, the leader of the HIMOINSA Team, accompanied by the Spanish debutant Jonathan Barragán, did not hesitate to stop, activating the emergency system and providing the Chilean rider with first aid care, although unfortunately, he was not able to continue the race. Shortly after, it was Ivan Cervantes who came across another rider in distress. In this case, it was Spaniard Txomin Arana, who had just suffered a very strong accident in which his bike was split in two, while the rider suffered possible torn ligaments in the knee, a broken bone in the hand and a strong blow to the cervicals. Cervantes did not hesitate to stop to assist Arana, who finally had to be evacuated by helicopter to a hospital in La Paz. Gestures of solidarity that are part of the true spirit of Dakar which, without the need to be written in any regulation, must be respected by all participants. This unwritten code was respected once again by both Gerard Farrés and Iván Cervantes, actions for which the organization has given them back the time they lost by assisting the respective riders. Below is the Stage classification as well as the overall, updated witht he time bonus for both riders. Consequently, Farrés finishes the stage in ninth (+13.16) and Cervantes 25th position (+31.32), which allows him to enter the Top 30. * The stage and overall times have been updated after the bonus for Gerard Farrés and Iván Cervantes for assisting injured pilots was issued.